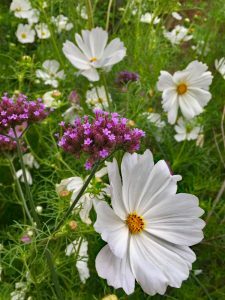 There are many possibilities in the topic of Gardens, so we have set out some overall themes to start with, along with some more specific ideas about how to grow and nurture our garden interests. We would like to hear what people think of these, and are open to other ideas as well – it is your group. 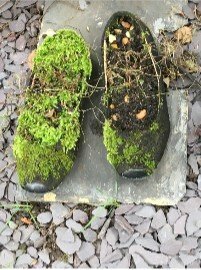 Our proposed themes are: Sharing practical tips, seasonal themes, types of plant, visiting gardens, garden design, practical work We will also make visits to gardens in the London area, and maybe to members’ plant containers, gardens and allotments. There was a cold wind and a few spots of rain but plenty of sunshine too, so U3A were not deterred even though the house gardener had cancelled the guided tour. 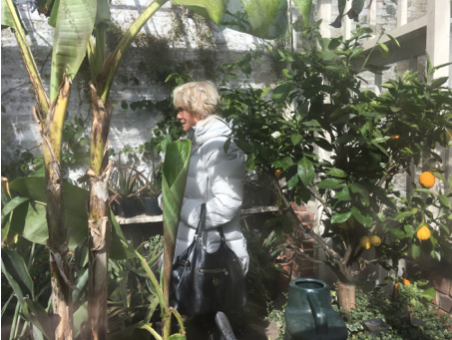 No matter, between us we knew the names and something about the habits of a good proportion of the plants which were out or starting to appear, demonstrating that gardening can be good for the memory as well our wellbeing in other ways! Bernita’s guided tour took place on a sunny Tuesday in late March, with a cold wind but many exciting signs of spring. 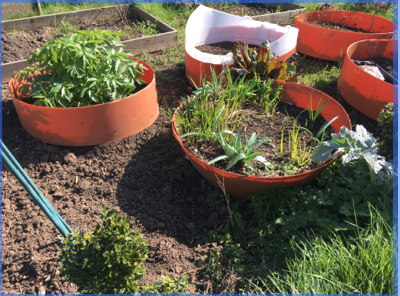 As a long standing allotment holder, Bernita was able to show us around a number of very different plots, the sheer variety of the uses to which people put their plots to grow flowers, crops and construct sheds and places to sit and relax was amazing. They do have an open session with lunch on the first Sunday, 12 – 2 p.m., so get yourself along to the entrance on Winton Road N10 if you want to find out more. Some plots were deeply dug over, earthed up in the traditional way for the potato crop, while others had adopted a ‘no dig’ approach in different types of raised bed, ideas which may be helpful for those of us with back troubles. There were wooden sided raised beds filled with well rotted compost which rots down over time. 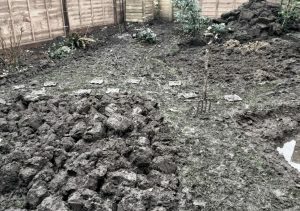 Others used the same principle, but with link boards, a rot-resistant product to frame the beds, while some had used ‘found’ materials from skips or Freecycle, and yet other had piled wood clippings deeply on areas of thick, wet clay. 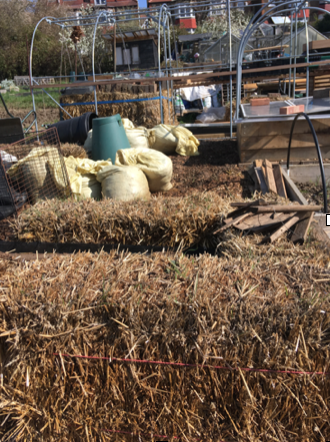 Another approach was ‘hot beds’ using straw bales as the frame for the bed and filling the space with fresh manure. This isn’t suitable for all crops but pumpkins and courgettes can do well on the heat generated. Bernita was using ‘lasagne beds’, in raised boxes 1mx1mx1.5m starting with 3”/25 cm of woodchip, a 2” layer of green food waste, then a few layers of broken up cardboard, a layer of well rotted compost mixed with broken up rotted wood or bark to create air pockets, then watered well before planting seedlings in pockets of compost. The warmth from the composting process can help accelerate growth. Bernita keeps bees among other talents, housed in a fenced area with high mesh sides, which means their flightpath is high, and avoids anxious or allergic neighbours. Honey bees don’t usually sting, but this can be more likely if their flightpath is impeded. There’s a pond near the bees, and as we know from previous discussions about encouraging pollinators, access to water is really helpful, but this pond is fed by a small spring and the running water has made for a healthy crop of watercress too! The young gardeners group had impressively well advanced seedlings in a poly-tunnel. Later in the season it will be really interesting to see the results from all these approaches. 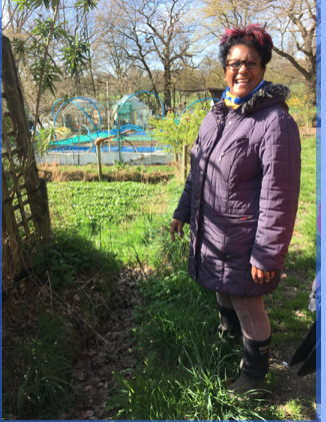 Thanks to Bernita for a delightful and informative visit, among the fruit tree blossom and the sound of blackbird and woodpecker, and to her fellow allotmenteer for the lovely fresh picked lettuce leaves! This month we visited the garden of Steve and Liz in Park Avenue North. It was a surprise to most people that this wonderful exotically Mediterranean garden had such a variety of plants that need very little watering, and most of them can stay outside all year. After the summer weather we had this year, maybe this kind of garden is the way to go! 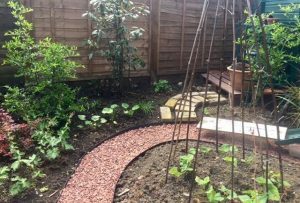 The varieties of succulents, cacti, agaves, and even peach and apricot trees, were very inspiring, showing that anything is possible in a London garden! The group met at Kathy Hammond’s garden. 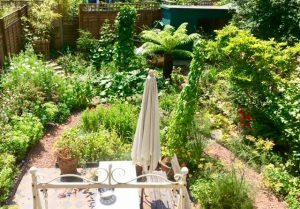 Kathy has moved to Crouch End in the last year and has created a new garden and wildlife pond. 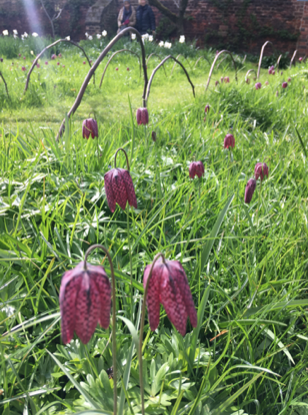 She talked about what she had learnt and what had worked well and less well, and the group shared tips on ponds, watering, seed growing and … that persistent problem – slugs. Kathy found The Ultimate Garden Planner by Peter McHoy fantastically useful – crammed with photos and diagrams and lists (bought secondhand at Oxfam book shop). Also The Tree and Shrub Expert, by D G Hessayon and Good Planting by Rosemary Verey (both books also found secondhand). Shallow levels are good for pond-life. 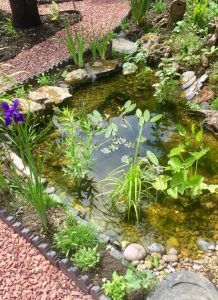 Frogs, newts and toads magically arrive once you have built a pond – and transporting amphibians from other gardens is not really a good idea as it is thought that can spread viral or bacterial diseases particularly amongst frogs. Some shade is really essential as young tadpoles and baby frogs cannot tolerate water that gets too warm (shade is something Kathy didn’t have enough of and she is working on planting some more overhanging pond-margin plants for next year). Newts are voracious eaters of mosquito larvae which is great news! 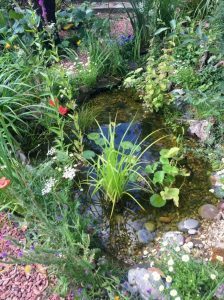 Waterside nurseries has great ‘how to’ tips for designing and maintaining different sorts of ponds. For (inexpensive) early veg and flowers sow seeds in Jan/Feb in potting compost and grow in a seed tray on a cool but well-lit windowsill and, once they have germinated, harden off the seedlings by putting them outside whenever it is warm enough. This works really well for most annual veg and flowers like tomatoes, aubergines, peas, globe artichoke, sweet peas, hollyhocks, sunflower, and morning glory. Some seeds like climbing french bean need a fairly dry compost. Rhubarb leaves contain oxalic acid and have been found to be effective against mildew and aphids. Look online for how to cook up the leaves and what concentration to use. Slugs Most of our gardeners thought slugs weren’t so much of a problem this year, but if you are infested then, nematodes seem to work against the small slugs that live in the soil, and for those giant orange horrors, try beer traps (cheapish if you use home-made beer), and if that doesn’t work … there is always the scissor treatment – make a regular patrol of your garden about half an hour after sunset, especially if you have just watered. Which plants worked well in the hot and dry summer? This year hollyhocks, lavender, thyme, sedum, rosemary, fennel all flourished in the heat and needed very little extra water. Several of our group had visited this garden when it is open under the National Gardens Scheme, but all agreed that the richness and intricacy of the design and planting here repays repeat visits – possibly many of them! The owners made us abundantly welcome. They introduced us to the sloping fern bed at the front, lovely from outside, and from inside where a semi basement window looks up and out onto this patchwork of greens and textures. Then out into the quite small but intensely planted rear garden, with such a lot going on its hard to know where to start. 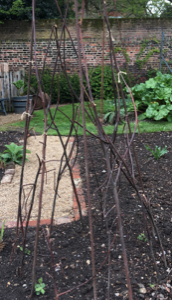 Some examples: a trellis in the back corner supports a clematis armandii with evergreen leaf and white winter-spring flower, wisteria for spring green leaf, purple flower in May and now sports long bright green velvety pods, so tactile! On the same frame a repeat flowering red rose for summer, a wildly twirling grape vine, and even a fig making its way up. Not an inch of wasted space and a delight together as well as each in their season. Backing the comfortable arbour underneath this profusion of climbers is an innovation of one of the owners, an ingenious fern wall crafted from strong wire mesh, carpet underlay and cable ties, with planting pockets holding an array of small ferns, bringing colour and texture to an otherwise dark corner, and greatly increasing the area available for plants. The exotic leaves of pauwlonia and banana centre the built-up back boundary, with the cool sound of water cascading gently into several pools beside them, bordered with a wide variety of texture, colour, size and shape of foliage. Rockeries are apparently coming back into fashion, so this garden is ahead of the curve. Conceived to reflect the landscape features of the natural rocky environment, the several rockery areas have naturalistic fault lines between the tufa rocks, they fall in contours, there are surfaces for plants on all sides – again giving more planting spaces in this quite small, flat garden – and the plants are varied, intricate and to scale. 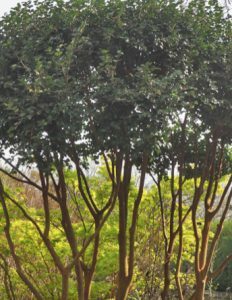 The owners love mountain landscape and foliage, and with 45 varieties of acer, uncounted ferns, ground cover plants, shrubs and trees have created an extraordinary lush haven with imagination and artistry. They made us feel quite at home with great generosity and a wealth of practical information. And then gave us such delicious home made cake! The weather was beautiful for our visit to Sue’s garden for the May meeting of the Gardens group, and the garden was full of lush spring growth. Sue told us about how the garden had evolved, from the sandpit years to garden ‘rooms’, with a sunny sitting and dining area, through a rose arbour covered in buds on the ‘Mme Alfred Carriere’ which will fill the air with sweet scent very soon, and down a curving path to greenhouse tucked away at the side, raised beds and a shady woodland area at the end. Colours and texture came from a deep blue ceanothus, explosions of purple alliums in the borders, the rich foliage of purple beech and sambucus, with a vivid green, feathery, acer palmatum providing a bright spring contrast. 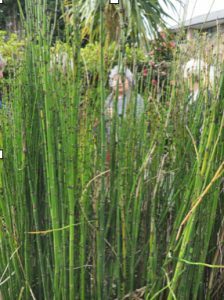 Sue has grown her long, narrow town garden to provide a delightful meandering stroll, greatly enjoyed by our group. We had our first plant swap, with all sorts of interesting cuttings going to new homes. New owners will give progress reports in due course, and more surplus plants will no doubt find welcoming spots in gardens around the district. The possibility of co-operative watering was suggested, to help over summer holidays. People who are interested can make their own contacts. The subtle colours, textures and shapes of the trimmed curves of Mona Abboud’s front garden give the hint that someone with a real interest in unusual plants lives here. Beautifully clipped specimens rub shoulders with wiry sculptural shrubs, shiny evergreens with tiny yellow starry blooms, and bright green feathery foliage studded with vivid red flowers. Passing through the house to the steep stairs at the back we gasp at the vista of Mediterranean and Australasian trees and shrubs stretching away into an endless tapestry of lush foliage. Mona’s garden is a story of clipping, pruning and shaping, executed with bold determination and an artist’s eye, to refine and develop a garden full of visual treats and year round interest. 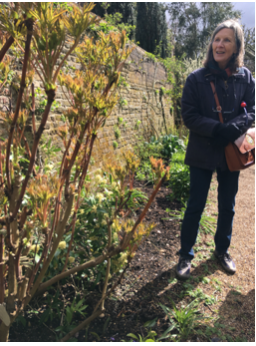 Our U3A Gardens Group is gathered near a neatly clipped double lollipop of variegated Rhamnus alaternus, a tender buckthorn, with strange inverted spires of Pseudopanax from New Zealand behind it and a strawberry tree and variegated Pittosporum on the left side. It’s taken Mona 19 years of composing, nurturing and shaping the many tender, drought loving plants which thrive under her care. 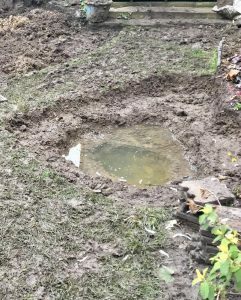 She loves plants which need free drainage, but her 100 metres of garden is on heavy clay, and a few days before our visit had a three inch deep lake at the bottom of the slope. The tons of gravel, grit granite and topsoil brought in by the barrowload to create the right conditions is a testament to her passion. A gently bubbling fountain surrounded by a curtain of Equisetum, a primeval species dreaded by most gardeners for its vigorously invasive nature, but here, confined in concrete basin, makes an elegant screen around the gurgling water. The garden is long and narrow, but the path twists down around olives and tea tree, crape myrtle, palm and bamboo giving constant changes of view. Many have been pruned to lift the crown of foliage, opening views through the close planting. The soft, tactile, copper-coloured bark of the Chilean myrtle, framing the fresh green of new acer leaves and willows is a lovely example of this approach. 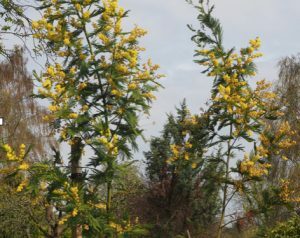 The varied textures, bronze and grey-green soft colour schemes and shapes give coherent themes, with splashes of bright colour like this lush yellow mimosa in full bloom. Mona told us it was her fourth attempt to grow this tender Mediterranean gem, and the sunny cloud of fluffy blossom was worth the effort. As well as being awarded ‘Best large back garden’ by the London Garden Society, Mona received the accolade of her Corokia plants being designated a National Collection. Native to New Zealand, these charming shrubs appear throughout her garden and are displayed together here in pots, showing their variety of soft colours. Top tip: In many ways more interesting than the box hedging which is so badly damaged by blight in many gardens, Corokia looks a great alternative, and is drought resistant too. 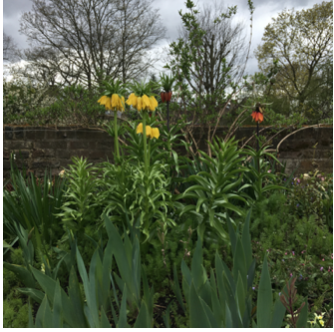 The Garden Group met in Highgate on 10th April at another local garden, Southwood Lodge, which is open to the public under the charitable National Gardens Scheme. 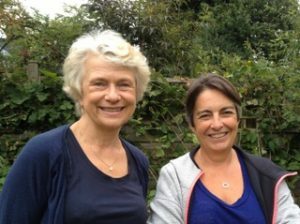 Sue Whittington was kind enough to offer us a U3A special guided tour, and answered our many questions about her unusual and wonderful garden. It was a grey day, so the views out from the hill were misty, but despite the weather the garden was a feast of interest. 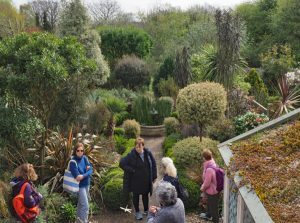 The Gardens Group made its first visit to a local garden whose owners open to the public under the charitable National Gardens Scheme. We wanted to see these ‘show’ gardens before they are at their peak, to see how they develop over the season, as well as to get inspiration for our own gardens. St Regis Close is an exuberant Tardis of a garden. Fronted by a classic magnolia, another world is tucked away behind a modern terrace of houses. Down a narrow side entrance it opens out into an extraordinary network of creative spaces, filled with sculpture, pottery and trompe l’oeil installations, including a Japanese tea house, all providing colour and visual interest at all seasons. 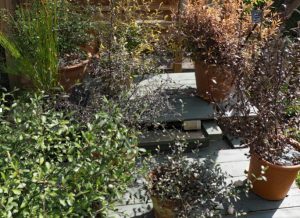 Every corner is a feast for the eyes, with a host of shrubs, trees, bedding plants and many, many pots and other receptacles – plants grow in all sorts of containers here, from chimney pots to a pair of shoes! Cuttings and seedlings are nurtured to plant out for the open days and for plant sales. Our artist hosts, Sue and Earl, had a story for everything, and along with their delicious cakes they gave us a most entertaining morning. The Gardens Group started well at the Open Event, and is now up to 30 members, all with a lively interest in a wide range of gardens and gardening topics. Our meetings began with sharing interests, problem areas and ideas for group discussion and activities. We had a discussion on pruning, and finished the year with a festive session including traditional American popcorn and cranberry decorations. 2018 started with tips from a local gardener, Alfie Bines, on Getting ready for Spring at our January meeting, with ideas for planning and preparing for the coming seasons with colours and shapes, and interesting shrubs which grow well in most local conditions. 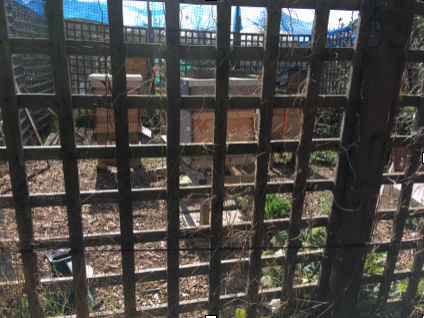 In February Chris told us about her experience of learning beekeeping, a complex task which needs training, and fascinating and productive when you have some expertise. Who knew there are 620 species of bee living in the UK? She also talked about creating pollinator-friendly gardens. Bees need water, so a pond, however small, helps them directly, as well as encouraging birds and frogs which will eat pests, avoiding harmful pesticides. A ‘bug house’ and a small log pile complete the bee friendly landscaping. If we then plant plenty of their favourite simple, non-hybrid flowers like salvia, borage, lavender (in pots if we have heavy clay soil) rosemary, sedum, herbs and winter flowers like sweet box, ivy and hellebores, we’ll be helping these essential creatures to benefit our gardens and the wider eco-system.